The joint higher education trade union national claim has been agreed by the five HE trade unions - UNISON, Unite, EIS, GMB and UCU - and was submitted to UCEA in March 2018. The claim, which covers pay, equality, workloads and precarious contracts, is available here. The Higher Education Committee (HEC) met recently and made a number of decisions in regards to the pay and equality dispute 2018/19 and the development of the joint trade union claim for 2019/20. HEC was unanimous in expressing the unions anger at the failure of the national employers at New JNCHES in their imposing of the rejected below inflation pay increase, and also their failure to make any meaningful offers on closing the gender pay gap, tackling widespread precarious employment and addressing concerning levels of workload, they agreed that UCU should take no further action and conclude the dispute . Please see this branch action note that provides details of the decisions and in particular the conclusion of the dispute. The latest HE national pay scales can be found here. The next steps in the developments of the 2019/20 and the dates for the negotiating meetings are advised. Branches will be updated with the developments in the pay negotiations as they progress. The result of the HE ballot is now available. England, Scotland and Wales saw a turnout of 41% vote in favour of a strike (69.8%) and action short of a strike (80.5%). In Northern Ireland, where the 50% turnout threshold does not apply, the result was 67.6% in favour of a strike and 81.5% for action short of a strike. It is clear that while large majorities of those who voted supported action, the turnout has fallen disappointingly short of the anti-union legal turnout threshold of 50%. While this result shows continuing anger about casualisation, workload and pay inequality among participants it is clear the union needs to reflect on the result and upon the large amount of feedback from branches and members received during the ballot. The union's negotiators meet on 25 February and will consider the union's approach to the 2019-20 pay round, including how best we can continue to highlight the unfairness inherent within the UK bargaining process in higher education as well as address the decline in the value of members' pay while taking into account the views of members. A further update will be provided to members following that meeting. The higher education national pay and equality ballot opens. In line with the decisions taken by the special HE sector conference on pay, UCU will now proceed to ballot members in higher education with regards to the 2018/19 national claim dispute. The ballot will open on 15 January and close on 22 February. A copy of the standard 'notice of intention to ballot' letter was sent to higher education institutions (HEIs) on 7 January 2019. A number of briefings for branch officers to be held during January and February is now also being finalised. HEC agreed that the aggregate ballot will open on Tuesday 15 January 2019 and will close on Friday 22 February 2019. HEC also agreed that the same two questions posed in the recent disaggregate ballot will be asked in the new year aggregate ballot; do members support strike action and do members support action short of a strike up to and including a marking boycott. HEC delegated the formulation of the industrial action plan, which will include sustained strike action and ASOS, to the national negotiators who will then consult the UCU national officers. New campaign and get the vote out (GTVO) materials will be developed and distributed to branches before the ballot opens and branches will be encouraged and enabled to share their GTVO plans. HEC also agreed that UCU equality structures will be consulted on the campaign materials. A series of national and regional briefings will be organised and will start before the ballot opens and run through the ballot period. The briefings will cover maximising GTVO and sharing best practice, local campaigns on gender, precarious contracts and workload, the industrial action plan and the joint national negotiating committee (JNCHES) agreement. HEC agrees to delegate to the HEC officers the exact timing and locations of the meetings and other arrangements. Finally, HEC also agreed to investigating how to implement Motion 8 on expanding the National Dispute Committee to include post-92 branch representation; and how the expanded post-92 NDC can take forward the pay and equality dispute; and that UCU will participate in talks with the other HE unions on both the 2019/20 claim and UCU plans for the current dispute. In addition UCU should work where possible with other unions also in dispute on the 2018/19 claim. At a special sector conference on pay delegates agreed to re-ballot higher education members for industrial action on the union's claim following the recent result of the first ballot. Conference decided that the new ballot would involve all branches but this time on an aggregate basis (all results counted together) and this would take place in the new year and no later than March 2019. The union's higher education committee (HEC) met to consider the ballot results on 2 November. There was no conclusive agreement at HEC on whether members should be re-balloted over this year's pay claim and this issue will now be considered by a special sector conference on Wednesday 7 November. The results will now be considered by the Higher Education Committee. UCU members in 147 UK universities* are now being balloted for strike action in a row over pay. The ballot opened on Thursday 30 August and closes on Friday 19 October. The law says UCU needs at least a 50% turnout in ballots to take action, so members are urged to vote early if they think education staff deserve a decent pay deal. The statutory notice of intention to ballot has now been served on employers in respect of the 2018/19 national pay dispute. The ballot will open on 30 August. Following members' overwhelming rejection of the UCEA final offer, on 17 and 23 July UCU participated in dispute resolution talks with UCEA and the other HE trade unions. During the meetings UCU negotiators pressed the employer's side to improve their offer on pay, gender pay, precarious contracts and workloads, all of which are core UCU policy objectives and headline elements of the campaign. It is very disappointing to report that the employers failed to sufficiently improve their offer. In line with the decisions taken by the Higher Education Committee (HEC), UCU has now written to the heads of institutions we believe are part of the JNCHES national bargaining arrangements˚ lodging a trade dispute with each institution and setting out the steps they should take to resolve the dispute. It is highly likely that UCU will now proceed to a statutory ballot of members over pay this autumn. Exact dates are to be finalised and branches and members will be advised in advance of the opening of the ballot. Following the recent consultation on pay where HE members clearly rejected the employers' pay offer of 2%, the union's higher education committee has decided to call a dispute and ballot members on industrial action. The ballot will open towards the end of August and run to mid-October. We're calling for an improved pay offer and progress to address inequality and precarious employment across the sector. Please help promote the campaign in your workplace with our posters and leaflets and make sure your personal and address details are up to date now so you receive your ballot papers safely in August. 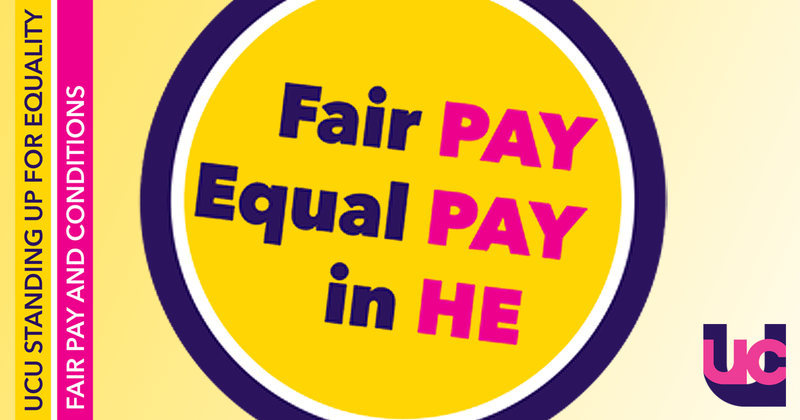 In a consultative ballot members in HE have voted to reject the employers' final below inflation pay offer of 2%, and have resoundingly indicated their support for industrial action in the latest campaign for pay and equality in higher education. 82% of members responding to the consultation voted to reject the offer and 65% said they were prepared to take industrial action in defence of their pay. The turnout was 47.7%. The next step in the campaign is a comprehensive get out the vote campaign for a national strike ballot to open in August and close in October. In higher education the only aspect of salaries that is getting bigger is the gender pay gap. The employers' latest pay offer of 2% does nothing to restore ground lost against inflation (a real terms cut of 21% since 2010) or to address gender inequality or precarious employment in the sector. However, as reported in the news this week, it is clear that the excessive pay and perks of vice chancellors (VCs) and principals persists and the latest voluntary code is inadequate. Please support UCU's campaign by voting in the UCU pay and equality consultation which opened this week. HE members will have received an email earlier this week containing a unique link to vote. If you need to request a replacement, please use this link. Make sure you vote in the higher education pay ballot. Eligible members working in HE should have received an email 'UCU pay and equality consultation'. 2% reflects a continuing de-prioritisation of staff pay; while the proportion of university expenditure spent on staff has fallen to just 54.7%, reserves held by institutions have increased by 259% and capital expenditure by 34.9%. In addition to their below inflation pay offer the employers have also made no meaningful proposals to address either the continuing casualisation of the HE workforce or gender pay inequality. Higher Education Sector Conference 2018 resolved to ballot members for industrial action and to work jointly with the other trade unions and to call a Higher Education Sector Conference in the autumn on HE pay. Pay: 2% increase for staff on spine point 16 and above. £425 for staff on spine point 15 and below. Pay related matters: the offer on gender pay is that the current working group will continue and look at developing a survey and review action plans. Precarious contracts: the offer is for limited work in regards to fixed term contracts and variable hour's contracts with a focus on data analysis. Scottish JNCHES sub-committee: UCEA are not supportive of progressing the development of a Scottish sub-committee. You can read the full offer in the national negotiators' report to the annual HE sector conference 2018. Pay - an increase to all spine points of 1.7% or £350 whichever is the greater. Gender pay - some qualified further joint work (to be developed) on gender pay, building on the new work stream developed by the gender pay group established as result of last year's settlement. Workload and excessive hours - UCEA rejected a monetary payment in recognition of the excessive hours worked. Hours of work are a locally determined matter but UCEA will consider how they may be able to comment further in this regard. Precarious work - UCEA do not wish to progress a UK level action plan to tackle the wide spread use of exploitative contracts. UCEA have indicated a willingness to consider some work in regards to the most insecure contracts. Scottish JNCHES - UCEA are not supportive of establishing such a fora. The trade union side has agreed to respond in detail before the final meeting. The UCU negotiators' view is that this is a disappointing offer that falls short of even keeping the value of pay in line with the increases to the cost of living and does not address the serious and wide spread issues of pay inequality, workload and precarious employment in the sector. On 26 March the first of the three scheduled negotiations took place. The trade unions side presented our claim and the employer's representatives at UCEA gave a response. UCEA confirmed they have a mandate to negotiate and will respond in detail to the unions claim, however it is disappointing to note that no opening offer was made.